Fall has arrived and that means sweater weather is in full effect! Though I love to wear sweaters with just about everything from leggings to jeans, there’s nothing like a sweater and skirt combination complete with a pair of tights to really elevate your look. No matter your style, there’s a sweater and skirt combination out there for you. To help you master this look, all you need are a few key pieces and some easy style tips. 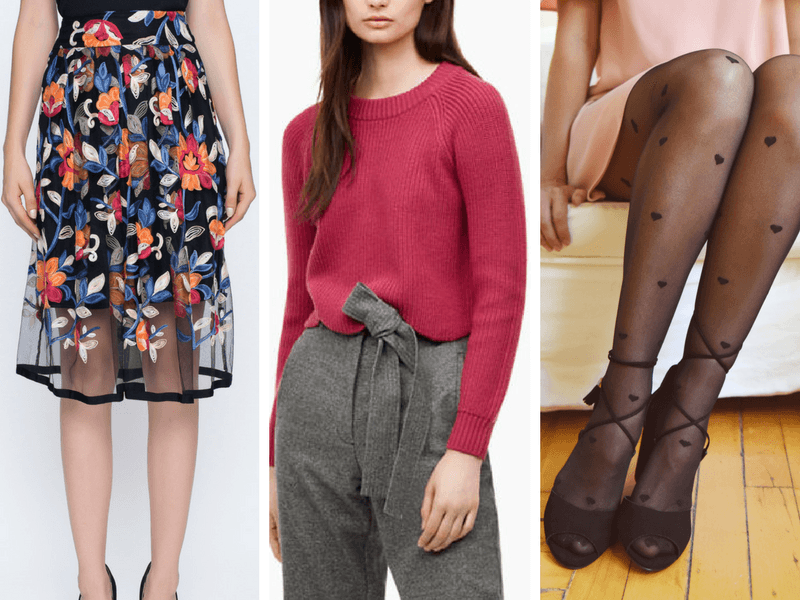 Here are 7 sweater and skirt combinations for fall that you can buy right now! Rachel’s tip: Layer a loose sweater over a fitted skirt for a layered fall look that’s also comfortable. Rachel’s tip: Transition your favourite summer denim skirt into fall by combining it with a pair of sheer tights. Rachel’s tip: Have fun with colour this fall and opt for a sweater in a bright cherry hue that you can wear with a black skirt that has equally colourful detailing. Rachel’s tip: Over-the-knee tights is the ultimate way to put a spin on a simple black skirt. Wear them with a loose grey sweater and get ready to make heads turn! Rachel’s tip: The midi skirt is all the rage for fall! Try the trend for yourself with this patterned skirt. Rachel’s tip: Elevate any simple black look with these white polka dot tights and a pair of statement booties. Rachel’s tip: Mix complementary colours in similar fabrics for a bold head to toe look. What’s your favourite sweater and skirt combo?